Thank you Fran Wiesse From Joe Gallo "Boston Bronze and Stone Speak To Us"
Great turn out at the Welesley Hills Universalist Unitarian Church 40th kick off Anniversary of "The Wellesley Weston Life Time Learning Presentations". Many attendees dozens of books sold! 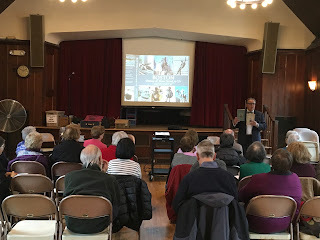 Thank you so much for your excellent presentation to Wellesley Weston Lifetime Learning today. As predicted, it was a grand start for our spring semester. I heard so many enthusiastic comments! You've certainly set the bar for the rest of our classes. Now to schedule a few walking tours as the days grow warmer and longer. Boston Massacre Remembered after 246 years. 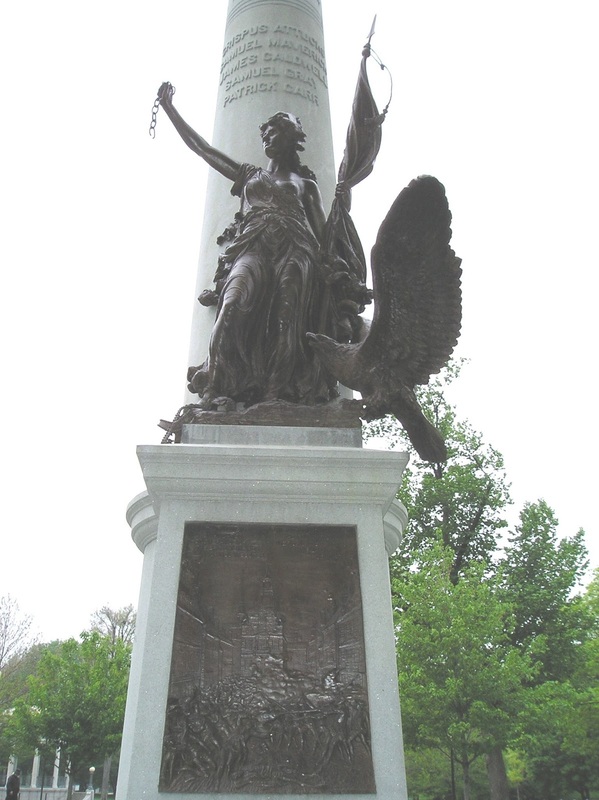 This very dramatic Freedom, depicted with the flag, a broken chain, an American eagle, and a trod-upon British crown, are positioned before a column with the names of the five Bostonians killed by British soldiers in the 1770 encounter. 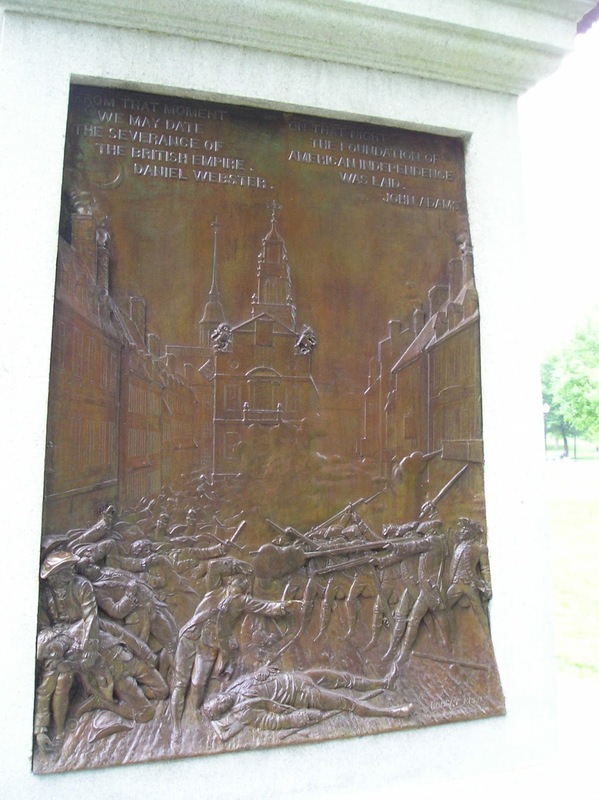 The high relief bronze plaque below depicting the massacre features an extended hand which visitors love to shake, keeping it polished. 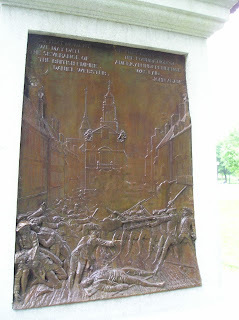 Crispus Attucks, famed as the first black to give his life for this nation, lies in the foreground. His shoe also protrudes from the relief and visitors keep that polished as well. "Boston Bronze and Stone Speak To Us" Spring Talk Schedule 2016. 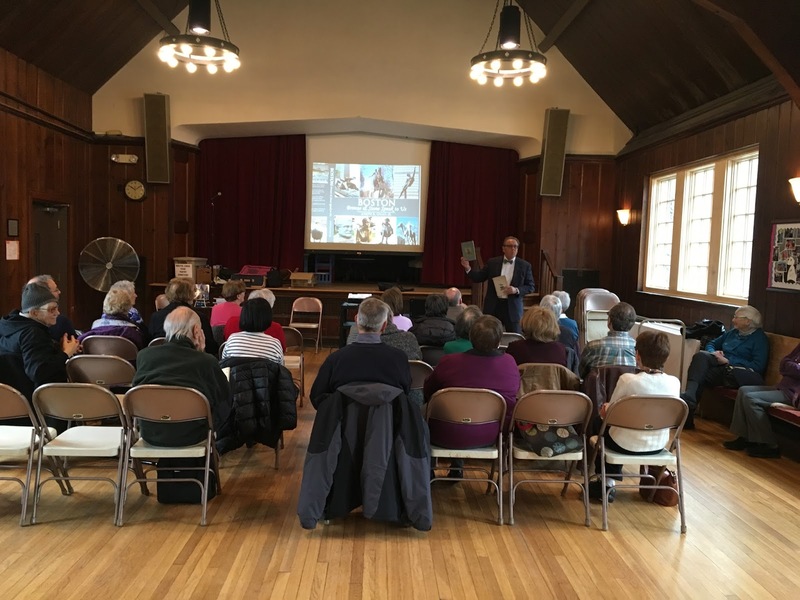 Thank you Fran Weisse of Wellesley -Weston Lifetime Learning Presentation of the "Greater Boston Cultural Institution"for inviting me. May 17th 2016 7:00 PM; Thomas Crane Public Library 40 Washington Street Quincy, MA 02169. Thank you Clayton Cheever for inviting me. 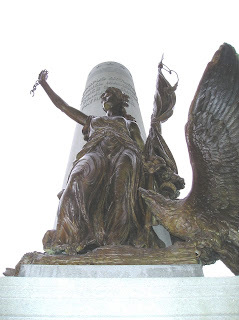 May 19th 2016 11:40 am - 1:00 PM; University Of Mass Boston Campus ,OLLI Spring Brown Bag Presentation/ "Boston Bronze and stone Monuments and America's Leadership. May 20 th 2016 1:00 PM - 2:00PM; Diamond Middle School , Lexington, MA Thank you MS Diane Gallagher for inviting me.